I admit. I am in a bit of a quandary and there is no way out. It never fails to happen. I have know that a set of pastoral stoles need to be completed for a young pastor. His first call was with a parish that had stoles, so he never had the need to acquire his own set of Pastoral stoles. Then he came to our church, and we do not have stoles for every season in the church year. And so, as the seasons come along, a few stoles have been made. And thankfully, the summer season is ordinary times and the green goes on for ever. But fall is upon us, and the seasons change quickly, as does the call process within our church synod when there is a vacancy. To make a long story short, I confess to a terrible case of procrastination. The set of stoles were not started in a timely fashion. Oh, there were excuses and reasons, such as the extensive photo shoot for all of the fabrics for the new website. The photos have taken months to accomplish. And on a sad note, our family lost our beloved Border Collie this fall. So, here we are at Thanksgiving Eve, the end of the church year, and the new church year beginning this coming Sunday. There will be a farewell to a vacancy pastor and installation of a new pastor, and in the midst of it all, a set of pastoral stoles in all of the liturgical colors will be created. And then there is a family wedding in about five short weeks! And yet, when all is said and done, I think it will turn out well. I had originally planned on having designs digitized and embroidered by machine for use on this set of pastoral stoles. The set back this fall has been the work required to photograph a large collection of fabrics. The project consumed months of time, leaving little free time for cleaning up vintage ecclesiastical embroidery designs such as those in the image below. Planning has become the key to ensuring this set of pastoral stoles will not only be completed on time, but to ensure the designs will work with the items available on hand. There is no time for ordering anything in the way of trims or fabrics. Everything must be pulled from current inventory. That places certain limitations on the project. Since the use of embroidery designs is almost impossible, a wonderful alternative to decorate the stoles is the use of orphrey bands. The above fabric pattern is Fairford which is a brocade. Fairford is available in solid colors, as well as in two-toned combinations such as the black/gold fabric pictured above. 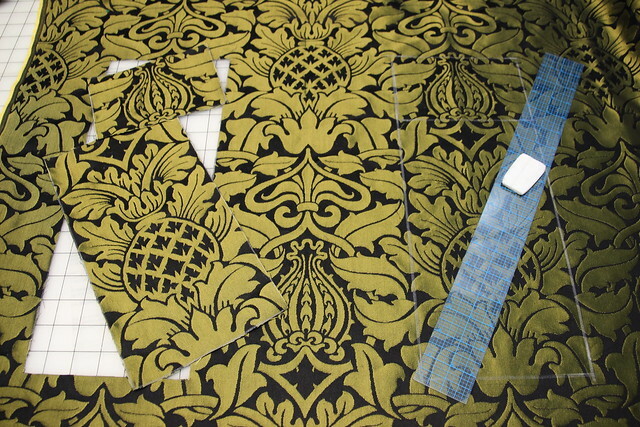 The Fairford fabric has been cut to a piece equivalent to a quilter’s fat-quarter. Fairford has two main design motifs: a pineapple and an ogee motif. I selected the pineapple as the motif for use at the bottom of the stole. When a motif is selected, I look for good places above and below the main design for possible cutting lines. 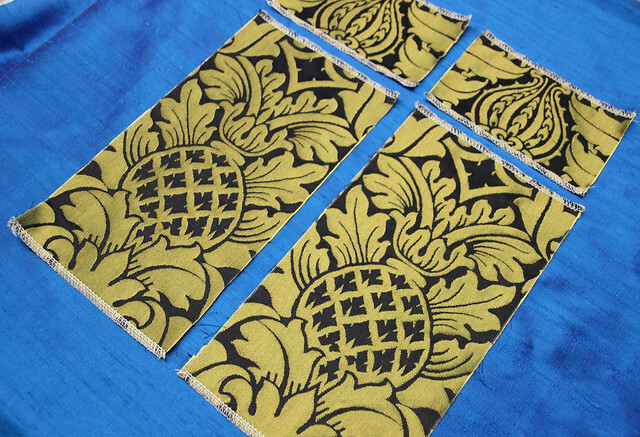 After centering the pineapple motif within the selected cutting lines, the finished size is 12″ for the lower band. Notice the placement of the line has no waste, and the ogee design becomes the perfect selection for the upper orphrey bands. The cutting lines are drawing with tailors chalk only after I am certain that this is the final design selection. The next step is to cut the motifs out, and there is no going back once the orphrey bands are cut. When trying to select possible motifs for orphreys, I try to keep the waste to a minimum, and where possible, use even the smallest pieces for some future project if at all possible. It is surprising how useful these fabrics can be. But that is a topic for another day. In looking at the way the above fabric was cut, there is a band in between. 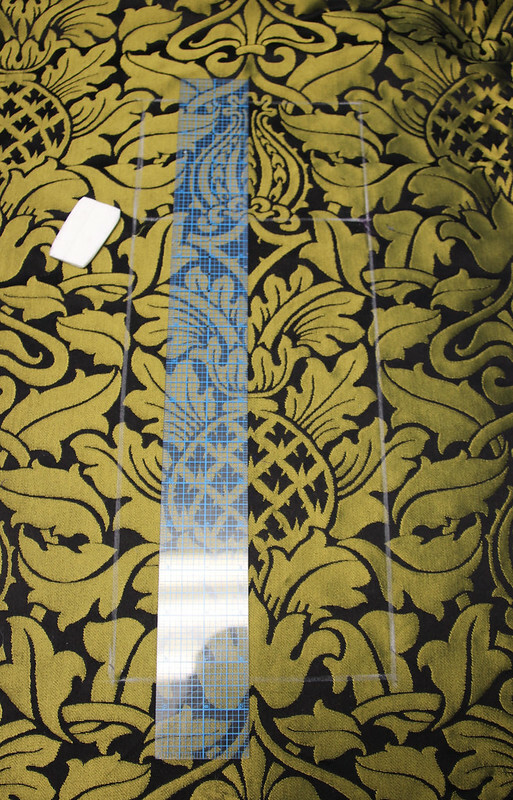 Because Fairford has a staggered pattern repeat, the remaining fabric would be enough for an additional stole. This process takes some careful planning to ensure proper placement prior to cutting. The intent is to give you a general idea of the process for this evening. As time allows, and as my photography skills improve, a more detailed, step-by-step set of instructions will be developed. The final step in preparing the orphrey bands prior to attaching them to the stole is to surge the raw edges. I will be working on trim selection and taking you along on the journey. These Fairford orphrey bands will be used on a black stole for Ash Wednesday and Good Friday, but could the black/gold Fairford be used on a white stole? We will check that design option out as well. Until next time.